Time really passes by very quickly, especially now that we are constantly on our toes, busying ourselves with the little boy. His ensemble of pet animals – a giraffe, a pig rattle, an Ikea pig soft toy and a furry tiger – is always lying around on the floor at every nook and cranny of the house, resembling carcasses being strewn around by a careless bomb that went off unexpectedly. He likes to walk ALL around the house with his biscuits and bread slices, making sure that the crumbs fall and follow in his exact footsteps – perhaps in an attempt to mimic the actions of poor Hansel and Gretel. Just recently, he did the most unexpected thing of all – threw his beloved bolster right out of the window while none of us was watching him (don’t worry, we have window grills). That really blew his daddy’s top off. But now that the little boy’s tastebuds are maturing rapidly, I am enjoying more freedom to cook a a wider variety of dishes that both the boy and his daddy could enjoy together. Those times spent cooking pots and pots of (boring) porridge are long gone. Well, not that they are untasty, just a tad repetitive. Still, to play safe, I tend to cook more soup dishes because these go very well with rice, and so far all the soup dishes have worked very well. 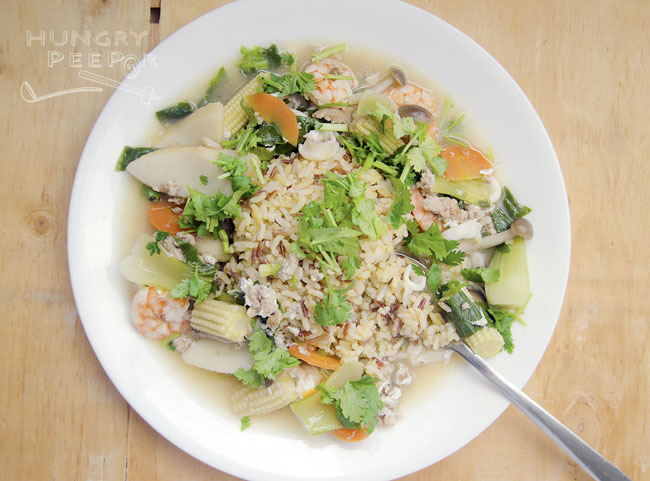 This recipe that I have here is a mixture of rice and soup in the same dish, which I believed would be a sure hit with the boy given its mix of vegetables, meat and fungi which he likes a lot. And it was indeed a hit. To my utmost pleasure. Combine everything for the gravy mixture in a bowl. Set aside. Mix egg yolks evenly into cooled cooked rice. Heat 1 tbsp oil in wok. 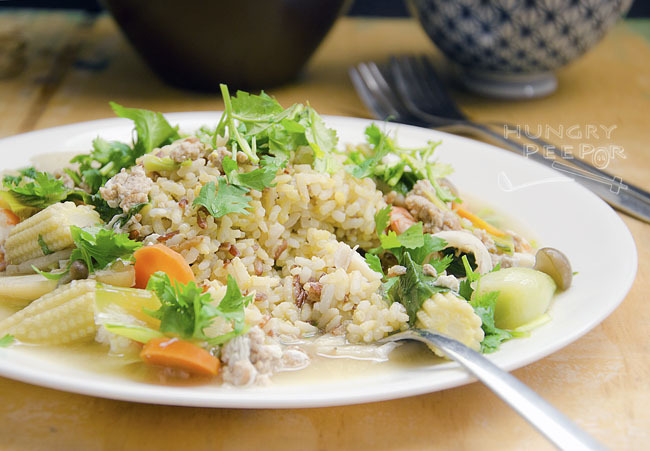 Fry rice till fragrant. Remove from wok and set aside. Heat 1 tbsp oil in wok. Fry garlic and ginger till fragrant. Add pork. Fry till cooked. Add carrot, baby corn, cai xin stems and shaoxing wine. Fry for 1min. Add mushrooms, gravy mixture, fish cake, prawns and squid. Add cai xin leaves and egg white. Switch off heat and stir to combine. Spoon gravy mixture onto rice to serve. For the purpose of letting the little one eat this dish, I have replaced sliced pork with minced pork and cut the leaves into smaller pieces. I have also added some brown rice to cook the plain rice with. It’s not necessary to fry the rice actually – using plain rice works just as well if you’d like to save yourself some efforts. This entry was posted in Chinese, Rice and tagged Cantonese, Gravy, Seafood, Stir-fry, Vegetable. Bookmark the permalink.